Juu（又称 ǃKung，前称北科依桑）是个单一方言区，约 45,000 使用者。常见的方言有 ǃKung (ǃXũũ) ((knw), (oun), (mwj)), Juǀʼhoan (ktz), 和 ǂkxʼauǁʼein (aue). Khoekhoe This branch appears to have been affected by the Juu-Tuu sprachbund. ^ Pumza Fihlani. Trying to save South Africa's first language. BBC News, Northern Cape. 2017-08-30 [2017-10-11] （英语）. Barnard, A. 1988. "Kinship, language and production: a conjectural history of Khoisan social structure." In Africa: Journal of the International African Institute 58.1, 29-50. Ehret, Christopher. 1986. "Proposals on Khoisan reconstruction." In African Hunter-Gatherers (international symposium), edited by Franz Rottland & Rainer Vossen, 105-130. Sprache und Geschichte in Afrika, special issue 7.1. Hamburg: Helmut Buske Verlag. Ehret, Christopher. 2003. 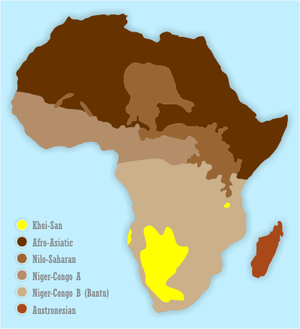 "Toward reconstructing Proto-South Khoisan." In Mother Tongue 8. Jouni Filip Maho. Khoesan languages. Web resources for African languages. 2003–2008 [2008-09-17]. （原始内容存档于2008-09-20）.